Earlham Iowa is a city in Madison county Iowa that was founded in 1869. Located just 30 miles west of Des Moines has become a popular place to live that small but yet easy commute to the capitol city. Earlham is home to around 1,450 residents and has been experiencing an economic revival. 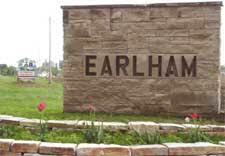 To learn more about the city of Earlham. 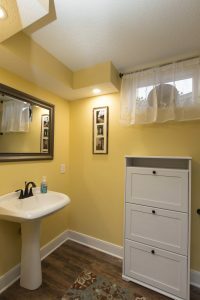 Compassion Builders constructed the bathroom seen in the above photo on a basement finishing/remodeling project in Earlham Iowa. Keeping natural light in this basement was important since there were only two windows in the entire basement. So, we designed this space keeping the door directly in line with the window to allow the light to flow into the main area outside of the bathroom. We faced a few challenges in relocating a structural post to allow for the door to line up with the window as well as an HVAC Duct that couldn’t be pushed up into the floor space due to the modular design of this home. The photo above shows how we solved the problem. We rerouted the ductwork to the perimeter of the room above the shower. This allowed us to keep the maximum head room in the shower and turn the bulk head into a design feature. We decided to balance this feature above the pedestal sink. Since lower ceiling heights are common in many basements finishing and remodeling projects, wall lighting can become impractical. This feature enabled us to use recessed lighting to this customers satisfaction. 2 four-inch Lotus Led recessed lights were used to flank the mirror to provide ample light. If this client ever decides they want more or need more light above their sink we can easily add additional lights. A pocket door was used in this situation to keep this smaller bathroom from felling cramped due to the swing of the door. The shower is a spacious 5 feet by 3-foot sterling 3-piece unit that we use on many remodeling jobs. 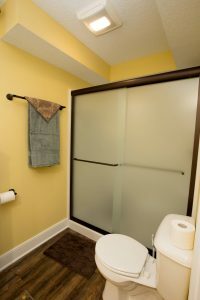 A sterling frameless frosted glass shower door was added to control the water and add that extra touch of privacy. Wood look LVT flooring was chosen for its moisture resistant features. 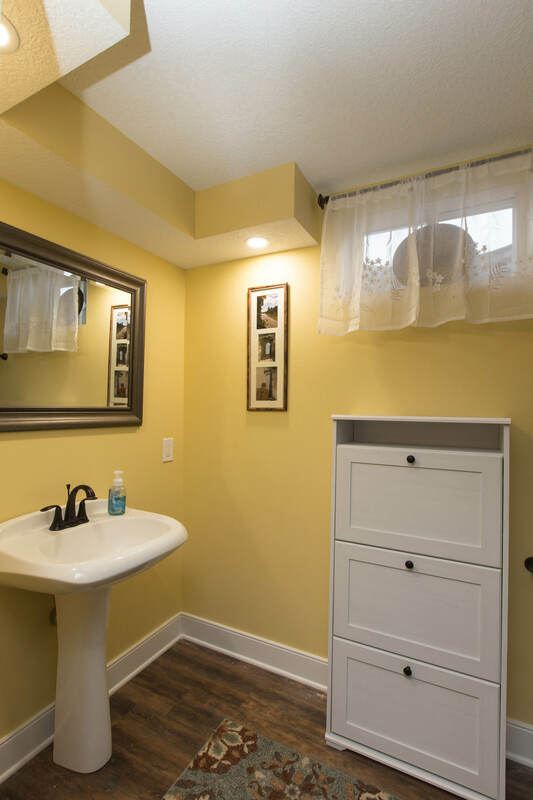 Let Compassion Builders become your contractor of choice for your Custom home or basement finishing and remodeling projects in and around Earlham, Iowa. If you’d like to see more of this project visit our Basement Remodeling page! Dedicated to quality, provides great design ideas and does not cut corners. If you want it done right, this is your company.